The TS4-R (Retrofit)-O (Optimization) Module Level Power Electronics (MLPE) combined with the proven Sunny Boy-US inverter is a game-changing Power+ Solution to cost-effectively optimize residential systems, ensuring higher energy yields. The SMA Power+ Solution, combines legendary SMA inverter performance and intelligent DC module-level electronics in one cost-effective, comprehensive package. There is no one-size-fits-all solution in today's solar landscape because each project has its own unique challenges and objectives. For this reason, SMA's MLPE solution is ideal because it can be applied per module for operational simplicity or selectively for faster installation. The TS4-R-O module components can be used like traditional MLPEs and satisfy all of the challenges that incumbent solutions address, but unlike traditional optimization, which requires MLPEs on every module even when it's not needed, the Power+ Solution can also be applied selectively. This reduces installation time, service risk, and ultimately cost. Selectively deploying TS4-R-O can save on installation time, while realizing greater energy production and roof usage, and providing a higher ROI. Selective deployment is also ideal when it comes to service and O&M. Fewer components mean fewer potential points of failure and less risk, and when service is required, it is simpler. The module-based DC technology is supplied by the universal TS4 platform, which offers various levels of plug-and-play functionality. The TS4-R-O is an add-on, retrofit option that makes any system instantly smarter and more powerful. Benefits of the TS4 line include module-level monitoring, shutdown code compliance, shade mitigation and increased string lengths. Whether for shading, shutdown, different module configurations and other challenges, TS4-R-O is the ultimate solution. TS4-R-O (Optimization) is made for enhanced energy yield and increased design flexibility. This cover is ideal for roofs with significant shading, optimizing each module in the string. It also offers safety and monitoring. 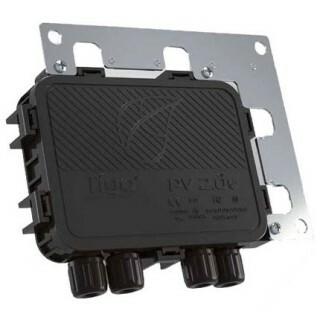 Install on all modules for maximum system output or only on the modules that are shaded. TS4-R-S (Shutdown) provides the necessary safety and monitoring services to ensure your solar system complies with local fire regulations. At the same time, it provides you with increased insight into system performance. NOTE: A CCA Rooftop Communication Kit or CCA Outdoor Kit (sold separately) is needed for monitoring or shut down. EXTRA NOTE: SPS (Secure Power Supply) must be permanently disabled when the TS4-R Modules are installed as part of the system.